This 15-minute multi-rater online questionnaire quickly gathers a number of individual perspectives on new or existing job roles. It is particularly effective at gathering data when stakeholders are based in different sites, locations and/or countries. The Job Profiler is a quick and efficient job analysis tool providing the basis for fine tuning interview guides and selecting the appropriate assessment methods. Applicable across sectors and roles, it is also used to develop and/or verify competency frameworks. 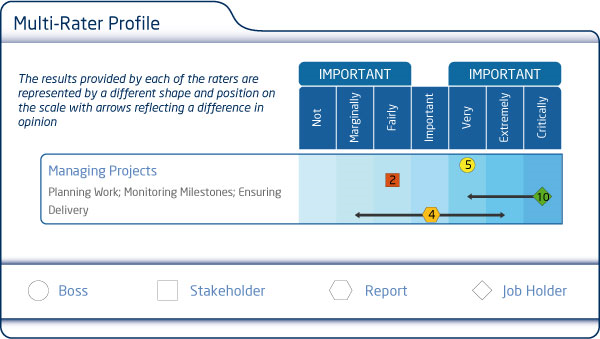 The job profiler report is a clear and visual report collating views across the Wave® Performance Framework i.e. behaviours, abilities and global measures with open text boxes recording views on job purpose and any additional requirements. The Wave® Job Profiler is part of our integrated assessment portfolio and aligns with the Saville Consulting Aptitude Tests, Wave® Focus, Wave® Professional Styles, Wave® Performance 360 and the Wave® Performance and Culture Framework.